Winnipeg’s Modernist Quarter is a small section in the northern part of the Exchange District, a living example of the architectural boom that took place in Winnipeg from the 1960s to early 1970s. The roots of modernism can be traced back to the late 19th century, when advances in technology allowed increased architectural innovation. 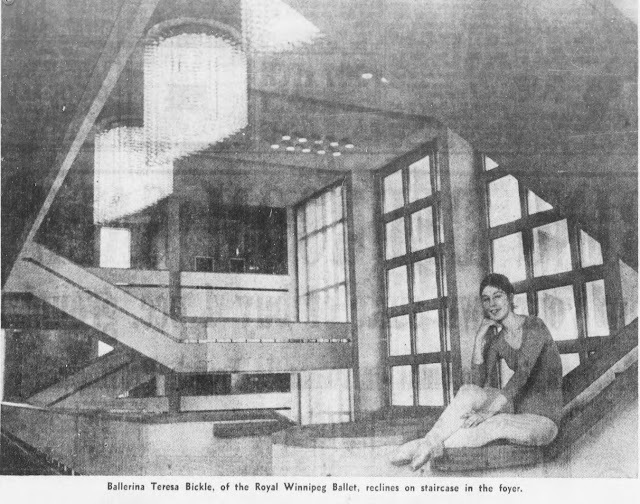 Winnipeg’s modernist buildings more draw inspiration from Brutalism and the International styles, which were developed throughout the 1930s and 40s. Many of Winnipeg’s mid-century modern buildings are located on Broadway, which underwent extensive alterations throughout the 1940s and onwards. A smaller collection exists in the Exchange, limited to a stretch of around four blocks between Princess and Rorie Street. Most prominent are the ones along main street, namely City Hall and the Centennial Center. The Centennial is home to the Manitoba Museum and the Centennial Concert Hall, both designed as part of a project to celebrate Manitoba and Canada’s centennial. The Centennial Concert Hall. Source: Winnipeg Free Press. 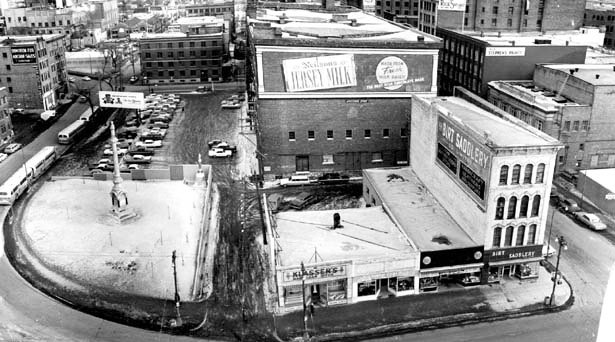 These structures were the initial steps of a larger plan that would completely alter the east side of the Exchange, creating a new and exciting modernist complex right in the heart of downtown (and, for the sake of our heritage warehouses, we are very grateful this did not succeed). Designed by three architectural firms, Green Blankstein Russell, Moody Moore and Partners and Smith Carter Searle and Associates, the Concert Hall cost $8 million and was designed to seat 2,305 people. The buildings facade along Main Strike is strikingly modern, featuring sharply angled stone and concrete. New technology allowed architects to play with style and shape in different ways, allowing unusual concrete molds that previously had not been possible. The section on Main Street where the Centennial Concert Hall was built. Source: Winnipeg Tribune. Along the front window, there are 45 molded concrete window shades, resembling eyelids. These molds had been created off-site before being placed in the desired location over the Concert Hall’s windows. Next to these window shades are two three storey windows, and the building is capped off by two tyndall stone towers. The buildings cream and charcoal tones were planned to match with Winnipeg’s City Hall just across the road. The interior of the concert hall is expansive and grand. The lobby leads to four, floating, white staircases and directly above are three chandeliers, made up of shards Norwegian Crystal suspended by metal threads. The staircases in the Centennial Concert Hall in 1968. Source: Winnipeg Tribune. In 1966, a call for submissions was put out to find artists to create three murals for the lobby, and Canadian Artists Greta Dale and Tony Tascona would be hired. Dale was born in Kelowna, British Columbia, in 1929, but moved to Ontario to study in the Ontario College of Art. In 1959 Dale, her husband, and their two children, moved to Mexico to allow Dale to study with Mexican muralist José Chávez Morado. Upon returning to Canada, Dale would eventually settle in Toronto - and then, in 1966 answered the call for design submissions. Of the artists chosen, Dale was the only one without any ties to Winnipeg. Dale’s mural, displayed prominently in the lobby, depicts the art of drama, music, and dance. Greta Dale's mural in the Centennial Concert Hall in 1967. Source: Susan Surrette. Local artist Tony Tascona also has two murals, made of painted aluminum, which can be found on both the left and right sides of the lobby. Tascona was born right here in Winnipeg, in St. Boniface, and at 20 would enroll with the Winnipeg School of Arts. His first exhibition was held in Montreal eight years later. Throughout this, Tascona worked for Canadian Aerospace Industries and Air Canada, and these work experiences inspired Tascona’s work with industrial materials. The opening of the Concert Hall was slated for Wednesday March 27th, 1968, though the entire week was full of scheduled events. Monday and Tuesday offered free performances for the workers who’d helped construct the Concert Hall, while Wednesday itself was the grand opening ceremony. Canadian Governor General, Roland Mitchell, was on-site to cut the ribbon and welcome 2,250 Manitobans into the multi-million-dollar building. Following this, there was a white-tie gala on March 28th. Tickets were $25 a couple, and guests would be treated to performances by the Winnipeg Symphony Orchestra and the Royal Winnipeg Ballet. Then, on Friday, Winnipeg students would take tours inside. The Concert Hall received rave reviews, from near and far. Eric McLean, a writer for the Montreal Star, reflected positively of the design and cost of the building and remarked “Music is better served in Winnipeg”. Advertisement from the Winnipeg Tribune in 1968. 1968 signalled a cultural shift in the downtown. Earlier, the Symphony Orchestra and the ballet had performed out of the Civic Auditorium (now the Provincial Archives building), on Vaughn Street near the Legislature. 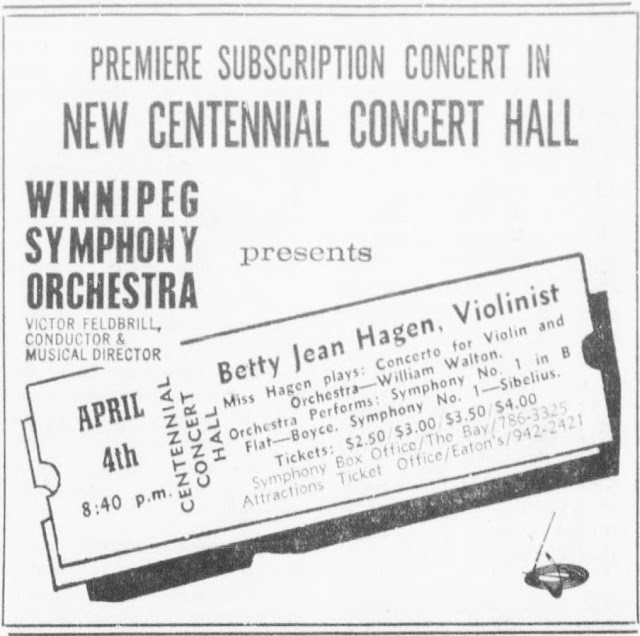 The opening of the Centennial Center brought Winnipeg’s larger arts institutions to the heart of Winnipeg’s downtown. Not long after, in May of 1968, The Centennial Center would welcome the Planetarium and then the Manitoba Museum in 1970. Today, these arts centers are still thriving. The Centennial Concert Hall remains home to the Winnipeg Symphony Orchestra, and the Royal Winnipeg Ballet (one of the oldest professional ballets in Canada, and the longest operating in North America). 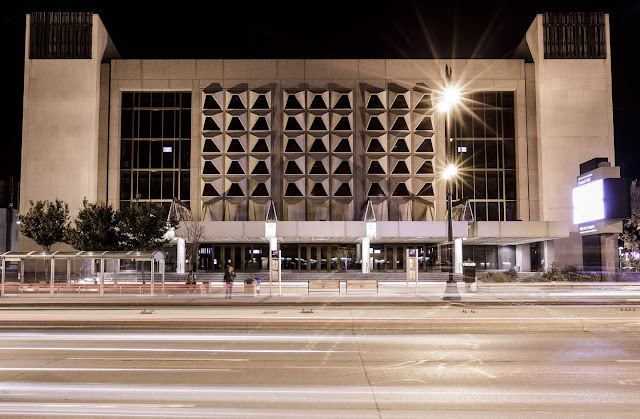 Further, they stand as an excellent remnant of the modernist dreams of 1960s Winnipeg.